Director Karen Kunc founded Constellation Studios in 2013 to pursue and pass on her passion for print, paper and bookmaking. The internationally renowned Nebraska artist established this creative gallery, workspace and professional classroom in a refurbished and historic building in Lincoln, Nebraska’s Antelope Valley neighborhood. Among Constellation’s printing presses, type shop, wet paper studio, bookbindery, print and book collections and mixed-use spaces, Kunc serves as mentor, artist, curator and community organizer, aiming to develop young artists, spur careers and cheer culture. Printmaking specializing in woodcut and etching, with non-toxic approaches. Artist book making, with letterpress type, innovative structures, imagery, interesting materials, bindings, covers, boxmaking. Papermaking with cotton, linen, kozo, local fibers, pulp painting, recycled materials, for sheet forming and experimental uses. We offer workshops to diverse audiences, to foster creative art encounters and educational enrichment. We exhibit and sell local, national and international art on site and online. We attract and retain artists through short-term residencies, retreats, workshops and gallery exhibitions. 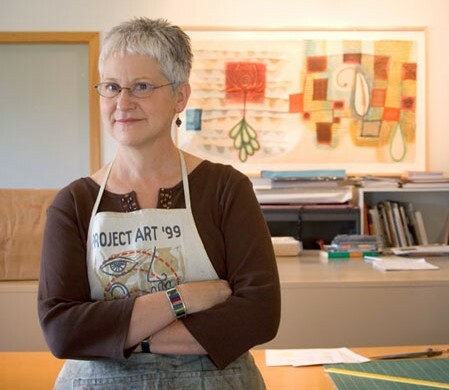 Constellation Studios Director Karen Kunc has exhibited and sold her artworks around the world in her more than 30 years as a professional artist. The renowned artist, teacher and mentor has established her reputation internationally in woodcut printmaking and book arts, both as a producer and teacher. Kunc continues to serve as the Willa Cather Professor and Professor of Art at the University of Nebraska-Lincoln, where she has taught since 1983. She is the founder the school’s Under Pressure Print Club — a community-based support group for UNL printmakers. See her extensive portfolio and learn more about her career and contributions at karen-kunc.com. Constellation Studios is the live/work project of internationally renowned artist/printmaker Karen Kunc, established in 2013, in downtown Lincoln, Nebraska. Constellation Studios is equipped with Kunc’s printing presses and equipment and designed for relief and etching printmaking, letterpress, papermaking and bookmaking activities. The ground floor houses the large open printmaking studio and gallery while the lower level features the papermaking lab and bookmaking studio.Constellation Studios is housed in a building constructed in 1910 that was originally a paint store. Renovated in 2013, with gallery space and studios, loft apartment and guest rooms, the architecturally designed spaces consider efficiency, displayable walls, high ceiling with natural skylight, all to create inviting workspaces. Under development is an outdoor classroom area, urban garden and Kunc’s colorful large mural painting. Through the 1930’s to 60’s businesses at this location were: the Lincoln Glass & Paint Company, the Sewell Paint & Varnish Company, and Center Paint & Supply, selling wallpaper and paint. 1940’s city maps indicate a tin ship to the east, an upholstery store to the west, among other retail storefront buildings. Successive businesses in the 1970’s – 2010’s included: Team Electronics, the Waterbed Company, BB &R Pawnbroker, Town & Country Investments Check Cashing, and Peter Hasselbalch photo studio. Constellation Studios is at 21st and O Street in the redevelopment area of Antelope Valley, on the east edge of downtown. Across the street is Union Plaza, a three-block urban park, with bike trails, scenic overlook, outdoor amphitheater, and public sculpture. Constellation Studios is designed by BVH Architects and renovated by Blue Rock Construction.